At Mobility in Motion, we carry automatic door operators in Cambridge from Power Access®. Power Access supplies both residential (model 2300) and commercial (model 4300) door operator models that can be easily retrofitted to existing doors. These door operators can be installed in homes, condos, apartments, colleges, libraries, government buildings, offices, hotels, hospitals, and more. No need for extensive renovations. 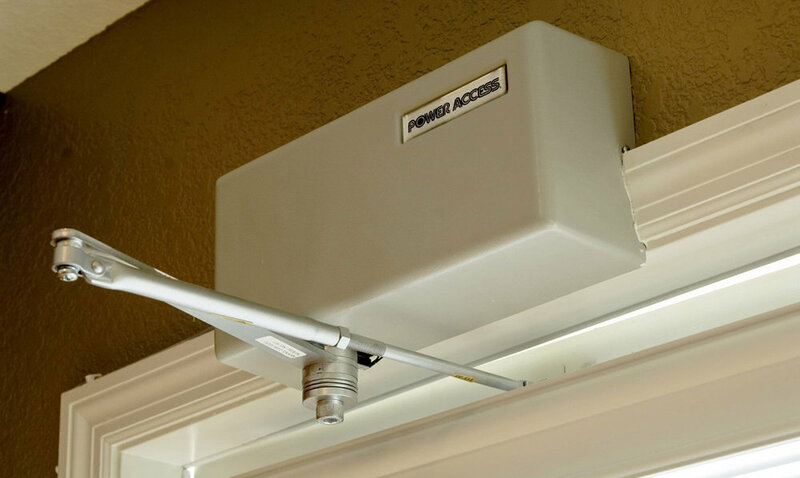 Power Access’s door operators are simple to install. Whether it’s for the residential or commercial model, you won’t have to modify your existing door or jambs. Both the 4300 and 2300 models plug into standard wall units and are designed to fit just about any interior or exterior door. When it comes to the products we carry, Mobility in Motion makes safety our top priority. The door operator models from Power Access are both equipped with built-in mechanical and electrical safety features. Both doors allow for manual operations. Additionally, these Power Access door operators can sense obstructions, automatically stopping the opener, timing out, and then closing the door. Mobility in Motion’s Power Access door operators are affordable and low maintenance. They can be used for years to come and come with a variety of controls including wireless or wired, surface or flush wall-mounted, keyless wall-mounted, and handheld devices. Contact Mobility in Motion today to order your Power Access door operators. We have stores in Cambridge, Guelph, Goderich, Owen Sound, and New Liskeard. For more information on the Power Access door operators, be sure to read the Power Access brochure for details.